In this day and age, if you want a website that’s working for you (not against you), you pretty much need a professional web designer on your team. New trends, advances, and marketing strategies are always cropping up. Though your website aesthetically might not need to be redesigned every couple of years, it’s likely that the behind the scenes and mechanics of the website will need to be continuously updated for maximum effectiveness. After all, you’re looking for high-quality content, good page rankings, and a website that’s functional and sensible for users, that still showcases your brand. A professional web designer will understand how to maximize your business’s website for better yields and traffic, all of which ultimately helps you. From chatbots to online videos, the digital world continues to change, and you need someone who can help you stay on top of it all. Almost every business these days has some kind of website. It’s practically a given, at this point. But what kind of website it is matters. We’ve all been on clunky websites or ones that are difficult to navigate or take us to other pages — and it’s a frustrating experience. Some of the time, we might simply navigate away to another page. On average, we have about ten seconds (or less!) to hook a consumer and leave an impression. They won’t give you any more time than that to tell them what your company can offer them. So first impressions are important. The way it’s presented is also important. Generally, users will only read a touch over a quarter of the content on a web page. However, bullet point lists might get them to read more — 70% of people read through bullet point lists, compared to just 55% who read lists that weren’t bulleted. Essentially, you want your website to load quickly, present information in an aesthetically pleasing way, and have it be easy to navigate. But that’s just the beginning! What Basics Do You Need to Have? Given that four out of five shoppers do so using their smartphones, having your website optimized for mobile usage is crucial. Almost 50% of users say that if a business site loads that is clunky with mobile, they’ll just assume that the business doesn’t care. Many will navigate away — and likely to a competitor’s website — at this point. Site engine optimization is another feature that should essentially be “built in” at this point! Not only does it improve search rankings, meaning that your business is likely to be found sooner and get better traffic, but it can also make the user’s experience better and make your site more usable. Website security is also crucial, especially if you’re conducting transactions on the website. You might be holding onto people’s personal and/or financial information, and that needs to be kept secure. If there’s a major breach, there’s a chance that people won’t return to your site or trust you to keep their information safe. If you need a total website redesign, a professional web designer will know the important elements to include right away, and what can be worked on. They’ll assess new trends, see how your website can consistently be improving, and implement those changes when needed. If they don’t handle SEO or PPC advertising, they might be able to refer you to companies or other experts who do handle that, and get you set up with those services. Those kinds of referrals can be invaluable and taking advantage of their connections can be a boon for your business. 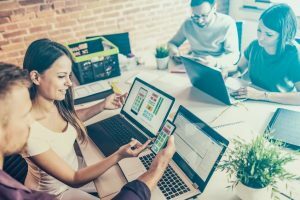 And, of course, they’ll make sure that your website looks modern, is easy to navigate, and loads on a variety of devices (computers, smartphones, tablets, etc.). Don’t fall behind the times — maintaining your website is extremely important and a professional web designer can help you get to where you need to be! Get Great Internet Marketing Tips! Follow us on LinkedIn or become our Facebook friend. Copyright 2018 MRN Designs, LLC. All Rights Reserved.